Afghanistan Puppet President of US and India Hamid Karzai has demanded US officials take action against Pakistan. Hamid Karzai has said that United Stated must stop Pakistan from helping the Afghan Taliban and should take Army Action inside Pakistan against Terrorists. Hamid Karzai also said that US must not give a timeline for leaving the Afghanistan otherwise it will increase the Courage of insurgents. The Statement has has came from Afghan President Karzai when his Government is facing serious charges of Corruption and his Security Adviser Muhammad Zia was also found involved in Corruption recently. 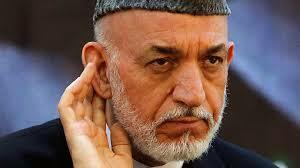 Karzai wants Americans to not give importance to Corruption in Afghan Government but to Taliban and Pakistan. President Karzai also admitted that we have not progressed in war against the Taliban. This Monday General David Petraeus also admitted that we are not winning the Afghan war and only way to end this war is by Talks.